The DJ Forry Company has been bringing the juiciest, best tasting Apricots to kitchen tables around the country for years. Like all produce we bring to market, we insist that our farming partners utilize the latest, most up to date farming and harvesting methods to ensure only the best and safest Apricots reach your table. It’s All In The Details. What better way to ring in summer than with sweet tasty California Apricots. Sweet and tasty are the key terms here. As far as we’re concerned, there is nothing worse than biting into a beautiful apricot and end up dissatisfied. We take great pains to make sure that you enjoy every bite. Once we determine that our fruit is at the perfect stage of ripeness for harvest, our work has really just begun. Apricots should be sweet and tasty with every bite. Always look for fruit that feels heavy for its size.and yields to gentle pressure. Once you get your fruit home, we suggest keeping it at room temperature until fully ripe. Eat it at room temperature or refrigerate for a really cool treat. When you want your daily dose of Vitamin C, look no further than Apricots! Vitamins: Apricots are an excellent source of Vitamin C, just one serving (approximately 174g) provides 26% of your total daily allowance! Apricots are also a fantastic source of Vitamin A, packing 60% of your daily requirement. These two vitamins are so important in our overall health. Fiber: Apricots are also a good source of fiber. Beta Carotene, Lycopene: Good for heart health. Lutein: For aiding eye health. Phytosterols: To help aid with keeping cholesterol in check. 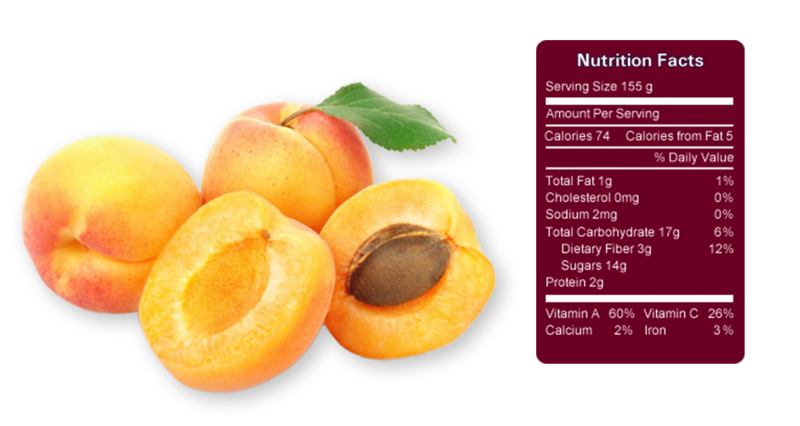 As a bonus, the average size apricot has only 50 calories so it falls into the category of a “Negative Calorie Food.” That means your body burns more calories to digest an apricot than it takes in from consumption. Now that’s pretty cool.